My hubby and I had a delish black bean burger when we were in Nashville and he recently requested that we find some. Well, I’ve tried the store-bought frozen ones, and props to them for trying but they weren’t nearly as good as the one we had. So, I remembered that a friend of mine had posted this recipe and I thought that I’d give it a try! Worth. it. Super yummy! In a food processor, finely chop bell pepper, onion, and garlic (If you have a strainer, then you could smoosh out the extra liquid from this so they will stick together better). Then stir into mashed beans. In a small bowl, stir together egg, chili powder, cumin, and chili sauce. Stir the egg mixture into the mashed beans. Mix in bread crumbs until the mixture is sticky and holds together. Divide mixture into four patties. Put each patty into a plastic bag or wrap in saran wrap. Freeze for three or four hours. If grilling, place frozen patties on foil, and grill about 8 minutes on each side. 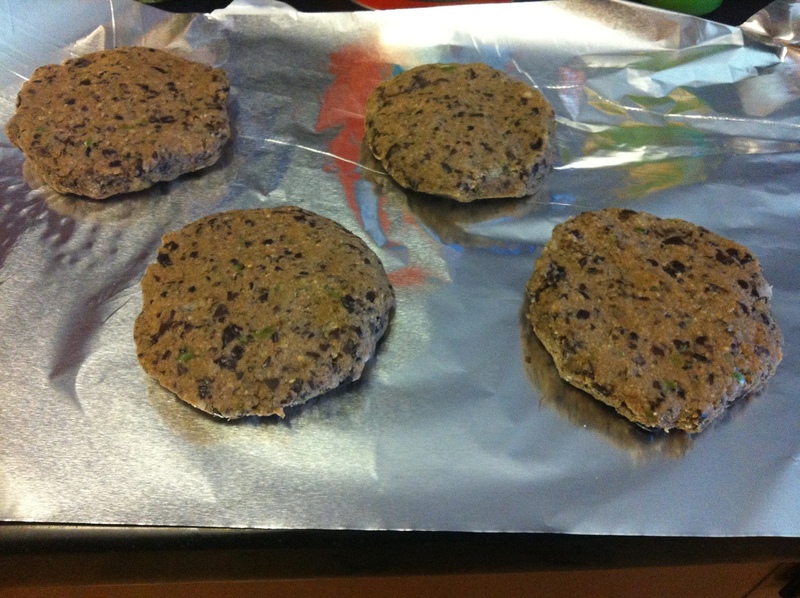 If baking, place frozen patties on baking sheet, and bake about 10 minutes on each side. These were just really great! They looked a bit like chocolate chip cookies so that was kind of a tease. I baked one for myself tonight but I would love to try it on the grill as well. Here is the original recipe… I added in my changes and borrowed some changes that other commenters suggested! Oh, one thing I’d like to try next time is doing 2 eggs… a few commenters said that made it more moist!